Concert tickets are $55, $45, $35 or $30, depending on location. VIP Packages (details above) are available through this link. A $3 facility fee and NC sales tax will be added to each ticket. Please note: There is an 8 ticket limit for this show. There is an additional $3.50 per ticket service fee on web purchases. To avoid this charge, call the Carolina Theatre Box Office at 336-333-2605 Monday through Friday from noon until 5PM, or visit the Carolina Theatre in person. Guests can opt to have tickets mailed to them for a $1 postage fee, or can pick tickets up at will call for no additional charge. The Friend or Foe album was Adam Ant’s first release as a solo artist and included three hit singles. The massive hit “Goody Two Shoes” reached #1 in the UK, was also #1 in Australia, and hit #6 on the USA Billboard Chart. “Friend or Foe,” the single, was another top ten hit in the UK while “Desperate But Not Serious” was the album’s third UK smash. The album was Adam’s most successful solo album to date, #5 in the UK and certified gold status on both sides of the Atlantic after selling over 100,000 copies. 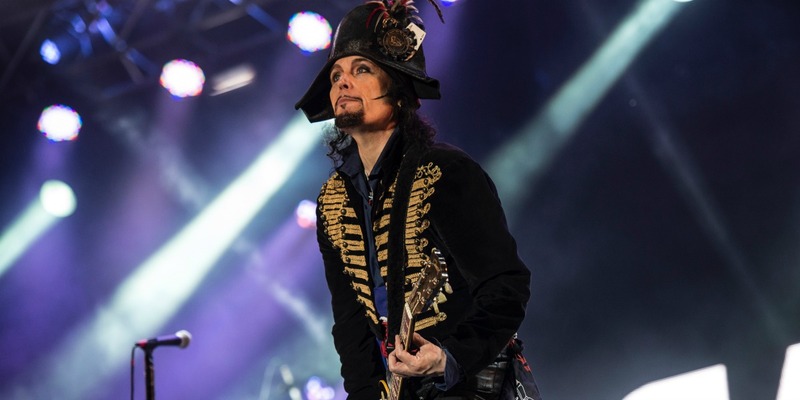 In the USA, the album reached #16 on the Billboard album chart and turned Adam Ant into a household name, resulting in a GRAMMY nomination for Best New Artist and an MTV Award for Sexiest Man Alive. From his early punk days in London to his explosion on the world stage that would lead to him becoming an icon, Adam’s musical career spans the course of nine albums and 22 chart-topping singles worldwide. His 1979 debut album Dirk Wears White Sox was the first number one album in the UK Independent Albums Chart. The follow-up album Kings of the Wild Frontier featuring his trademark burundi beat style of African drumming spent 12 weeks at #1 in the UK and was the best-selling album of 1981. That album produced three UK chart-topping singles, “Dog Eat Dog,” “Antmusic,” and “Kings of the Wild Frontier,” and won Adam a Brit Award for Best New Artist.